All About Eve and Showgirls are showing for the event All About Evil on June 24 at Museum of the Moving Image. 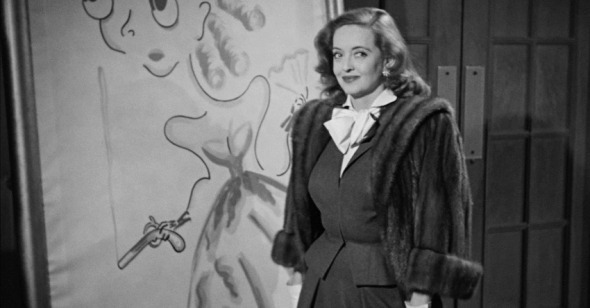 Of all the grievances listed by Margo Channing (Bette Davis) over the course of All About Eve—a long, detailed inventory expressed via some of the most quotable verbiage in the history of the American cinema—her most moving and curious complaint has to do with feeling unseen. “So many people know me,” she says with uncharacteristic sincerity. “I wish I did. I somebody would tell me about me.” For a woman whose incandescent reputation as a stage actress precedes her, the unsolicited opinions (and envy) of others are an occupational hazard, and Margo is well-armored against them. There is no hint or allegation that she can’t rebut or reverse, judo-like, on whoever cast it. But there’s real loneliness under her bluster and bravado. Does always being the center of attention mean living in a void? That sense of purgatorial paranoia, of having to always be on display for fear that someday nobody will want to look, is at the heart of Joseph L. Mankiewicz’s classic. And All About Eve does have one—a heart, that is—even if, like its heroine, its acclaim and canonization derive from a perceived imperviousness to feeling. Much of the film’s reputation is staked to the intricate bitchery of its dialogue, which refines and serrates the screwball style of its writer-director’s many pre-Code comedy screenplays; as in a play by Noel Coward or Oscar Wilde, the English language becomes weaponized, whether via bluntly full-frontal insults or pinprick putdowns (the judicious sotto voce asides are like shots fired from a silenced pistol). Upon reading a particularly disparaging notice written by the imperious theater critic Addison DeWitt (George Sanders), playwright Lloyd Richards (Hugh Marlowe) exclaims that “[it] drips with his brand of venom,” a line that is also meant as a self-reflexive commentary on the toxicity of Mankiewicz’s script, which seems to have been written in battery acid rather than ink. It’s tempting to watch All About Eve mostly as a showcase for verbal pyrotechnics, an understandable response that nevertheless belies how genuinely, and, in its way, humanely, the film engages with the pride, anger, jealousy (and other deadly sins) dredged up amidst all that vicious ensemble interplay. In a 1967 interview with Cahiers du cinéma (unpacked by Brian Dauth in an excellent 2005 Senses of Cinema essay), Mankiewicz explained that, regardless of genre, his movies were meant to “[present] human beings analytically… whether in depth or superficially,” and the deeply superficial (or are they superficially deep?) characters in All About Eve fully vindicate his approach. If the film is a come-dressed-as-the-sick-soul-of-showbiz party, it’s also genuinely interested and perceptive about what lies behind the disguise. As superbly played by Davis, who only got the part after Claudette Colbert dropped out, Margo is a tragic figure not in spite of her coruscating wit but partially because of it: she’s smart enough to articulate her anxieties about her waning desirability and professional obsolescence, which doesn’t mean she has the first idea of what to do about it. Forty-one years old when All About Eve was filmed, Davis had been portraying old souls onscreen for the better part of a decade, like the sullen aristocrat Regina Giddens in The Little Foxes (1941) or the drab spinster Charlotte Vale in Now, Voyager (1942). Her anguished, neglected housewife Rosa Moline in King Vidor’s unfortunate Beyond the Forest (1949)—she of the deathless, much-imitated declamation “What a dump!”—was the culmination of both her contract with Warner and her tendency to play characters described or depicted as dilapidated beyond their years. The story goes that Mankiewicz torqued the role of Margo to better fit the star’s brittle persona, and yet what’s affecting about Davis’s performance are the little blips of uncertainty and insecurity that accompany even her stingiest line readings. Her haughty posture just barely distracts from her downcast eyes and shaky hands; while stopping short of the camp signaling of Beyond the Forest or her subsequent role in Whatever Happened to Baby Jane? (1962)—a film that plays as a strange hybrid of All About Eve and its 1950 Oscar rival Sunset Boulevard—Davis makes sure we see how Margo is trying to hold herself together at the same time that she’s holding her own. Baxter’s skill at inhabiting a character whose eerie, tabula rasa hollowness leaves her perfectly suited to maneuver in a world that prizes skillful artificiality contrasts with Davis’s flickering projection of an authentically bruised inner life. Crucially, we don’t see much of Margo or Eve onstage despite repeated encomiums to their talent (whether meant sincerely or not by the Iago-ish Addison, whom Sanders acts with a mixture of glee and self-disgust), and yet by the end it doesn’t matter because in this scenario—and, the film implies, within the larger entertainment-industrial complex to which the story is constantly gesturing—talent is finally immaterial. As difficult as it may seem to empathize with a megalomaniac like Margo, her recognition of her own mortality via Eve’s ascent has a tragic dimension. Not because it’s unfair, but because it’s the way of the world—a natural rhythm of recession and renewal that Mankiewicz thematizes underneath all the snarling defiance. Margo gets what’s coming to her insofar as she meets her match (in both senses of the word), and yet Eve’s victory has its contradictory aspect as well. Mankiewicz’s perfectly circular wraparound structure implies that his villainess’ grip on the brass ring she’s worked so hard to reach will slacken and that her own ardent admirer, high school drama queen Phoebe (Barbara Bates) is waiting to grab it. Phoebe is Eve’s doppelgänger/body-snatcher as Eve was Margo’s, paying off a doubling motif left half-finished in Marilyn Monroe’s wonderful but truncated earlier cameo as Miss Claudia Caswell, a guileless graduate of the “Copacabana School of the Dramatic Arts,” who benefits from Addison’s patronizing patronage until he re-fixates on Baxter’s clever quisling. Mankiewicz’s reputation as a mediocre metteur-en-scène dogged him through every phase of his career (Pauline Kael mocked his lack of camera movement in her review of 1958’s The Quiet American), and yet All About Eve is a film of subtle visual pleasures, from the noirish shadows cloaking Eve when she arrives at Margo’s theater for the first time to the precise geometry of the blocking (as in a wonderful three-shot framing Margo, Eve, and Claudia as points on a continuum of female celebrity) to the repeated use of subtly complicitous over-the-shoulder perspectives to align us with certain characters’ judgmental envy and skepticism in key scenes. And there’s real—if unsubtle—virtuosity in the film’s justly famous final shot, which shows Phoebe posing in Eve’s robe in front of a multi-paneled vanity. The composition recalls Orson Welles’s trompe l’oeil effect in Citizen Kane while tweaking the meaning; instead of suggesting that the camera’s subject contains multitudes, Mankiewicz’s crafty mise-en-scène conjures up a horde of blank, scheming wannabes—a vision of narcissism ad infinitum that extends into the present tense; the split-screen address near the end of Gus Van Sant’s To Die For (1995) is just one of many contemporary homages to All About Eve’s ending. There’s plenty of All About Eve in Paul Verhoeven’s Showgirls (1995), a film that the director himself famously dubbed “All About Evil” during pre-release interviews; put simply, Showgirls is like All About Eve from Eve’s point of view. Like Eve, Nomi Malone (Elizabeth Berkley) is an archetype of pure ambition with a checkered past (“everything but the bloodhounds snappin’ at her rear end,” as Birdie might say) who’s taken on an alias to make a name for herself; like Margo, Cristal Connors (Gina Gershon) alternates between taking the new girl under her wing and giving her the cold shoulder; Joe Eszterhas’s script updates and vulgarizes Mankiewicz’s zinger-a-minute methodology while amplifying (if not necessarily deepening) the queer implications of the older film’s teasingly ambiguous headliner/ingénue, love/hate relationship, guiding Nomi and Cristal into the—half-pandering, half-empowering, fully hilarious—soul kiss that Eve never quite got to lay on Margo, or vice versa. Verhoeven also doubles down on Mankiewicz’s mirror motif, rendering Showgirls a tour-de-force of ersatz surfaces that nevertheless offer a faithful (and even revealing) reflection of All About Eve’s cautionary comedy about the costs and collateral damage of wanting to be known.